Today We are going to share new Method for Removing FRP any Security via ADB Commands. you can Follow This method for Removing SAMSUNG FRP 2016-2017 Security via ADB Commands. ADB and Fastboot are arguably two of the most indispensable tools used when working with Android devices. If you really want to modify, debug, and tweak along with their countless uses in rooting, and other procedures ADB and Fastboot are a must for any Android device owner. Typically if you want to install ADB and Fastboot you have to download and setup the Android SDK (If you really want to learn about Android Development I highly recommend downloading and installing the full Android SDK from here), but this can be unnecessary for people who just want to install ADB and Fastboot. 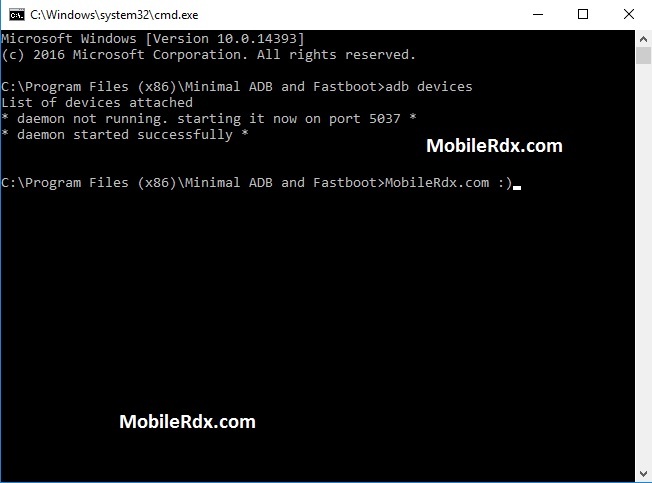 To simply the process I created a windows installer that will install the latest version of ADB and Fastboot for you quickly and easily. The total installation of Minimal ADB and Fastboot is around 2 MB in size (Compared to the 90+ MB size of the Android SDK Tools, and 425+ MB size of the complete Android SDK) making it very lightweight. A real time log of what is happening in background of our devices. It is really useful for developers to see which component has malfunctioned and helps to narrow down their search for what failed and what needs to be fixed. Several times users are asked to give logcats of their devices which are giving errors. We will go in detail that how to get logcats in every and easiest way possible. adb proves really handy if you want to install apks directly from your PC or want to batch install or delete them. You must have heard of Terminal Emulator. It is an app for android to execute shell commands(linux commands) which are basically present as applets in /system/bin, /system/sbin or /system/xbin(in our case) folders. A very imporant applet called busybox is installed there mainly used for execution of basic commands during root browsing or ROM installation. Many times updater script of ROMs use busybox commands to install it. Well, these commands can be initiated from your device too but they can be initiated from adb also making it easy for programmers. Of-course basic commands such as rebooting and rebooting in recovery mode and download mode are supported. Download ADB Enable Files from other Website. Install Tar file Through Odin or any other Tool. Now yours Mobile ADB Enabled and you can put These Commands through ADB Terminal. Congratulation Your FRP Remove Successfully. If all commands not working then comment on this post. I will give you any other solution for removing your FRP. Enable USB Debuggin from Setting. Open ADB and Fastboot Terminal.